I would like to thank you and everyone who has contributed to our campaign for Resolution 16-3. Together, we are emphatically calling upon the American Institute of Architects to officially support a new investigation into the destruction of World Trade Center Building 7 — and our message is being heard by thousands. On the final day of our fundraising drive, we are just $2,500 shy of the $20,000 needed to wage our campaign. I am truly grateful for the outpouring of generosity that has brought us so close to our fundraising goal. Please consider making a donation today before the window closes so that we can cover all of our costs of attending the AIA Convention. 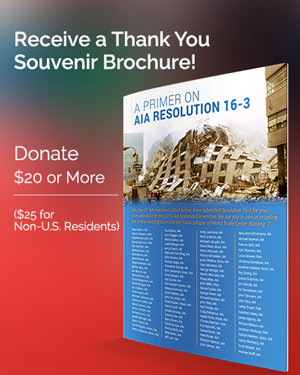 If you chip in $20 or more by midnight Pacific time, we will include you in tomorrow’s mailing of our brochure to 2,500 AIA leaders. The AIA Convention is the most important event of the year for us. 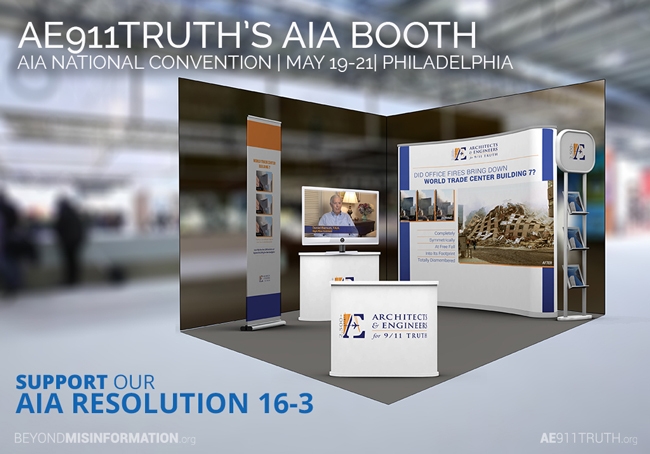 It is where we meet the architecture profession head on, expose countless AIA members to WTC 7 for the first time ever — and remind them that 1 + 1 ≠ 3. Someone must be the bearer of that message, and that someone is all of us.